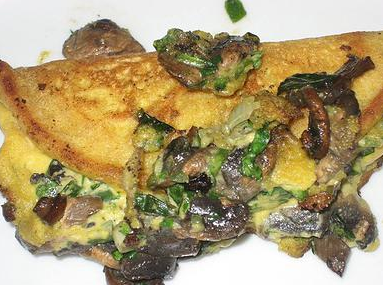 Chickpea Omelet with Spinach, Scallions & Mushrooms - Vegans Eat What? Vegans Eat What? Think you need eggs to make an omelet? This vegan omelet proves otherwise! In a mixing bowl combine the chickpea flour, baking powder, turmeric, garlic, and sea salt. Slowly add in the milk or water, whisking continuously to make sure you don’t get any lumps. Stir in the chives, mushrooms and parsley. In a small pan on medium heat, add the oil (make sure the pan is hot before you add the batter, otherwise you will end up with a sticky mess). Pour half the batter into the pan and cook until bubbles start to appear. Add the spinach or any other vegetable of choice. Fold omelet in half and continue to cook for a minute or two. Make sure not to overcook it, you want the middle to be soft. Repeat the process with the other half of the mixture for a second omelet. This recipe is Robert Oser. The omelet serves 2 people. Serve hot with toast & fruit and try the variations below. Enjoy! Add salsa, guacamole, or hot sauce as desired.